Nothing has inspired me more to feel confident working out than This Girl Can. 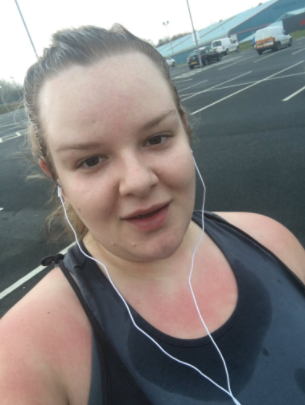 Whether it is in the gym, with a personal trainer, at a class or even generally being more active in my everyday life, I’ve always felt as though I was supported and almost protected by #ThisGirlCan, ever since I first saw one of their adverts on TV. It was of a curvier woman running over some hills and it was so empowering to see; if she could get out there and jiggle as she ran then so could I. What was even more empowering was the fact that she looked determined, focused and kept going even when she got tired, couldn’t run any longer and slowed down into a jog; she didn’t give up and it didn’t matter how fast or slow she was going because the point was that she was STILL going. I have felt a really strong connection to the hashtag ever since, as I’m sure you’ll know because I’ve been using it for so long. It isn’t just a hashtag, its a movement and a massive source of motivation, especially for myself who had always wanted to be more active but always felt restricted. Over the last year I’ve really changed my life by slowly trying to build my strength following an injury and becoming more active. This Girl Can has played a massive part in inspiring me to do that. No matter what your shape and size is, if you want to be more active, join in with a class or activity or try something new, then DO IT! Life is far too short to be wishing you could do something when you could take small steps forward to actually do it. Try it out and if it makes you happy, go for it. In recent years, I’ve really doubted myself and my ability for fear of looking a fool but actually when I started going to the gym, I found that everyone there was too busy focusing on their own goals; no one was focusing on me jiggling around. People are either supportive or keep themselves to themselves and no one has laughed at me despite my slow pace, very light weight lifting and wobbly body. There’s no shame in asking how to use a piece of equipment and people are far more inclined to help you than to risk you hurting yourself. Another thing that I’ve realised is that you don’t need all of the best gym gear; its not about LOOKING the part, its about TAKING part. So if its not having the latest plus size work out clothing that’s holding you back, then worry not as no one cares what you look like! Exercising has far more benefits than I ever imagined and they stretch far beyond how strong I am physically or what I look like. Being more active has changed my life and helped me to gain some of my confidence in my abilities back tenfold after something happened to me a few years ago that made me lose myself. Best of all, going to the gym or even just walking that little bit further across the car park does wonders for my mental health as its that little break in the day that reminds my feet to always keep going and my mind to focus on where I’m going; always moving forward. Head to the This Girl Can website to find out more about how they’re celebrating and inspiring active women, just like me and you. How active are you and would you like to get into fitness more? What is holding you back or what caused you to doubt yourself in the past? How has #ThisGirlCan inspired you? I really do need to start getting more motivated i'm not happy with certain aspects but no energy to do anything about it! thank you for the # link I shall see if it can help me !! What a great campaign, its good to get inspiration and get motivation from others. ThisGirlCan sounds like an amazing campaign. I love how it has inspired you to get out and get more active and love yourself as you are. It's such an important message for women, we all need to have more acceptance of ourselves. This is such an amazing campaign to be a part of. What a fab campaign i hadn't heard of it before, i work out six days a week and am currently on a weight loss challenge, im halfway there! I absolutely adore this campaign. It's so important that we as women feel empowered and strong through taking care of ourselves. Amazing campaign! Never lose your motivation! You're achieving great things!! Good luck! You are doing it and that is the best part. Plus… I always remember this …when I'm out running and I see someone speeding past me and I think I need to be as good as them, I have to say to myself they might have a different goal. Perhaps they are sprinter or running a very short race. Perhaps they haven't been to the gym this week and this is their first session. You honestly don't know what peoples goals are, so comparing yourself to anyone is actually silly – but I'm exactly the same and have just trained myself to think different. At the end of the day… so what?! You are amazing and you are looking after your health and that's all that matters! You go girl. It is a great campaign, so many people can get put off the gym by the idea of body beautifuls wearing the most fashionable gym gear, but it is so not about that. You are spot on about being worried about how you look or what others think not actually being the case or important and yet it puts so many people off going. How fabulous that this hashtag has inspired you and probably thousands of other. .